Trim a blue coloured cardstock in a size a bit smaller than the white coloured cardstock base. 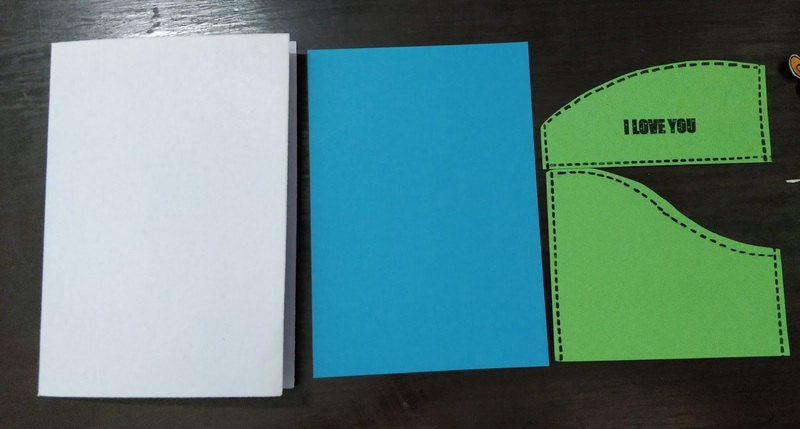 Cut two panels from Green cardstock in a "hill" pattern. 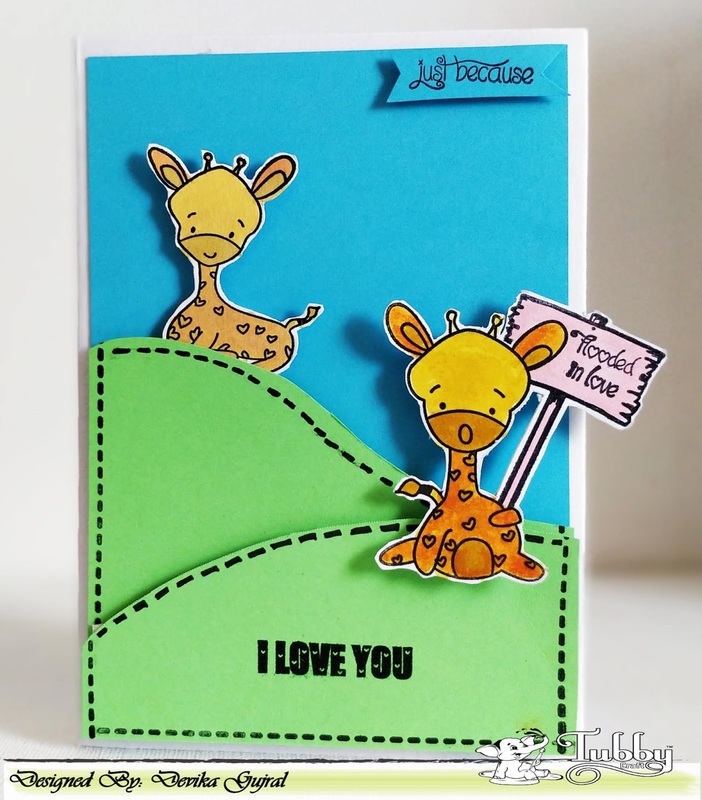 Stamp the sides of the green cardstock with the stitched line stamp from the Meraki stamp set and also stamp the sentiment from the Giraffe love stamp set using Tubby craft Jet black ink pad. 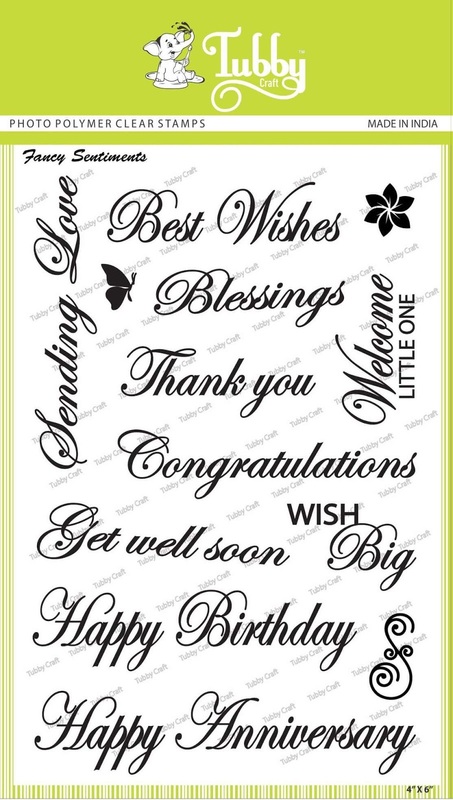 Heat emboss the "I love you" sentiment with clear embossing powder to give it that glossy finish. 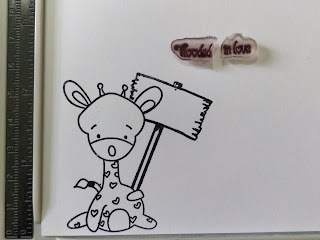 Stamp the giraffe image from the Giraffe Love stamp set using Jet Black tubby craft ink, on a white cardstock. You can use this trick for other stamps also and use these cut stamps to mix and match with other stamps. 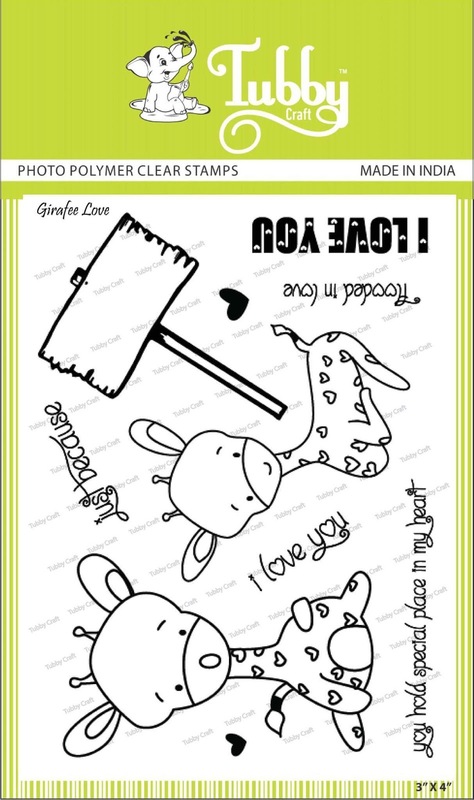 Stamp the other image, fussy cut it and colour it. Foam mount the images and you think cutest, love filled card. 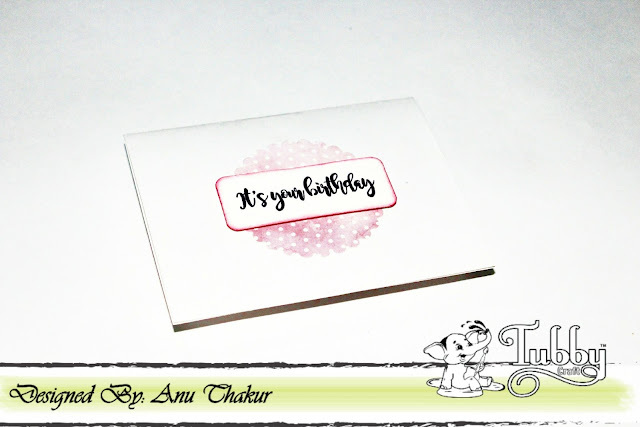 I also stamped another sentiment on the inside. Create the background by blending different coloured inks. 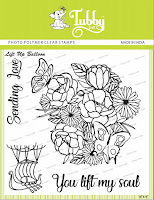 Stamp the floral bouquet from the "Lift up balloon" stamp set and Get well soon sentiment from the "Sentiments" stamp set using Veramark ink. 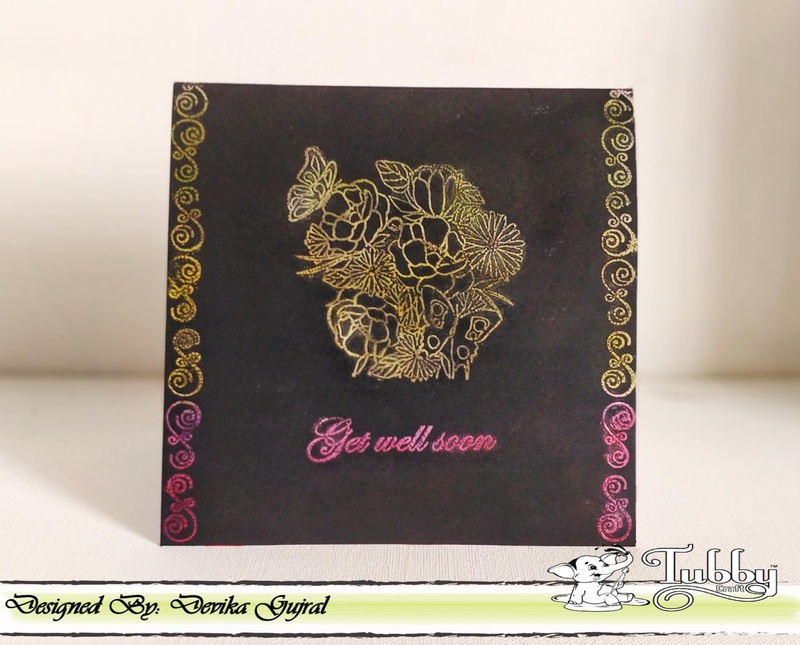 I also used another design from the Sentiment stamp set and created a border on both sides of the card. 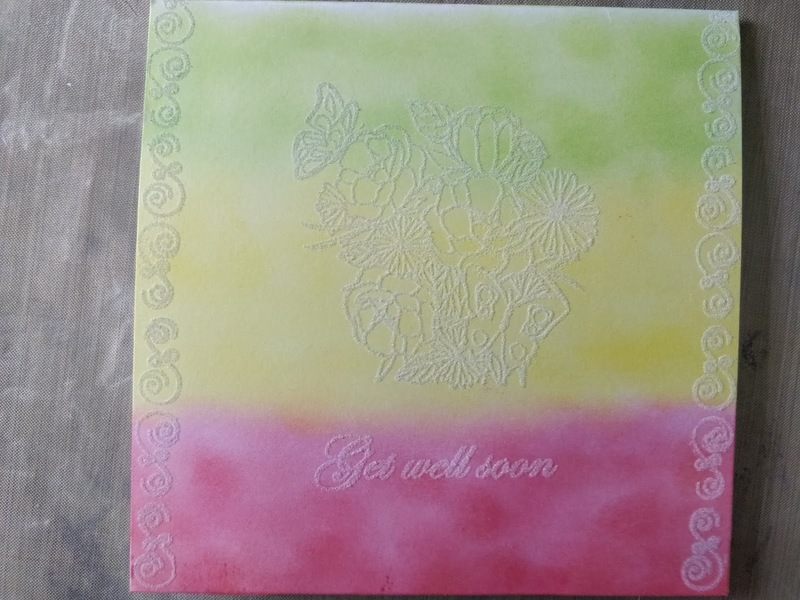 Heat emboss with clear Embossing powder. 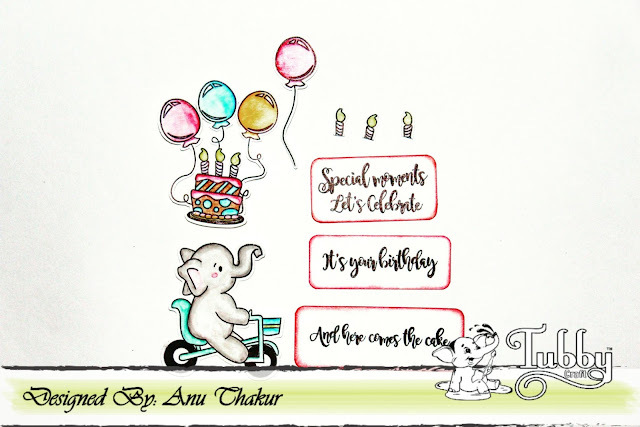 Smoosh the black ink on the entire card. 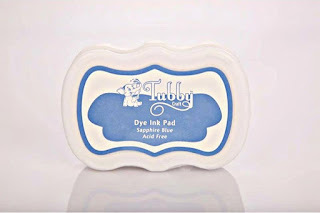 Wipe off the black ink using a soft cloth. 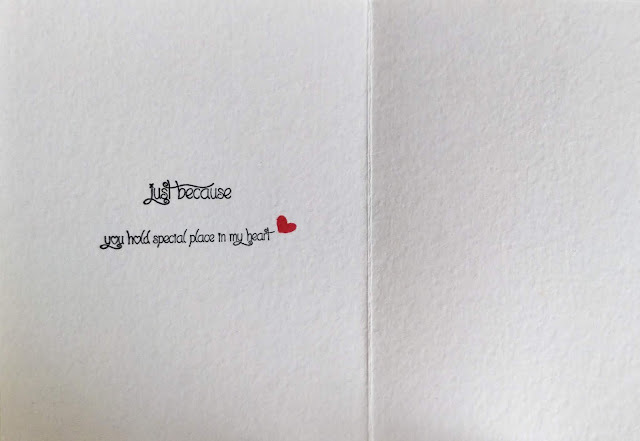 The heat embossed images resist the ink and the coloured background below these images show up! 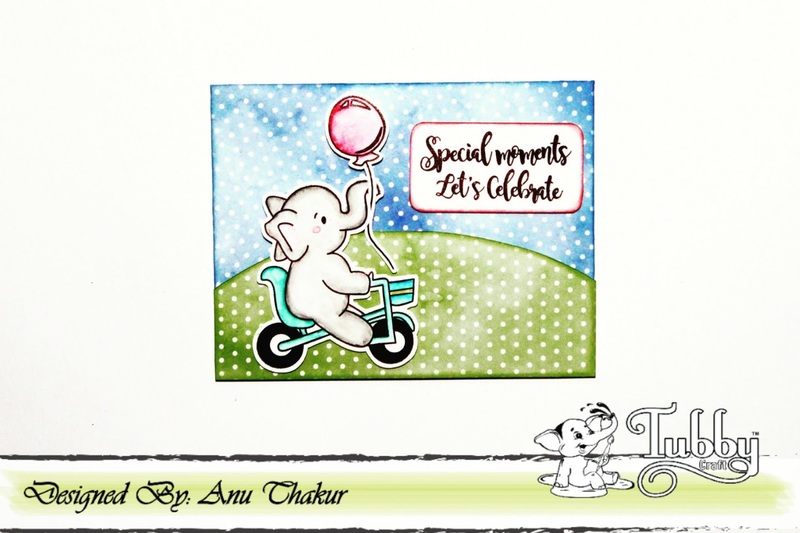 Hope you loved the cards shared today! Please do comment and like this post. Hello everyone!! 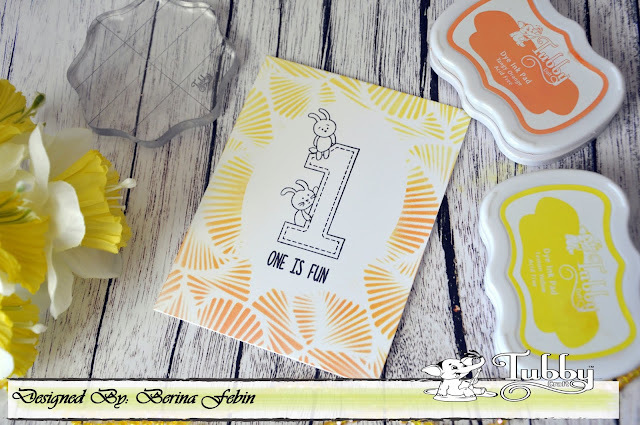 It's Berina here today with 2 quick and easy ink blending cards with stencils and Tubby Craft Dye inks. 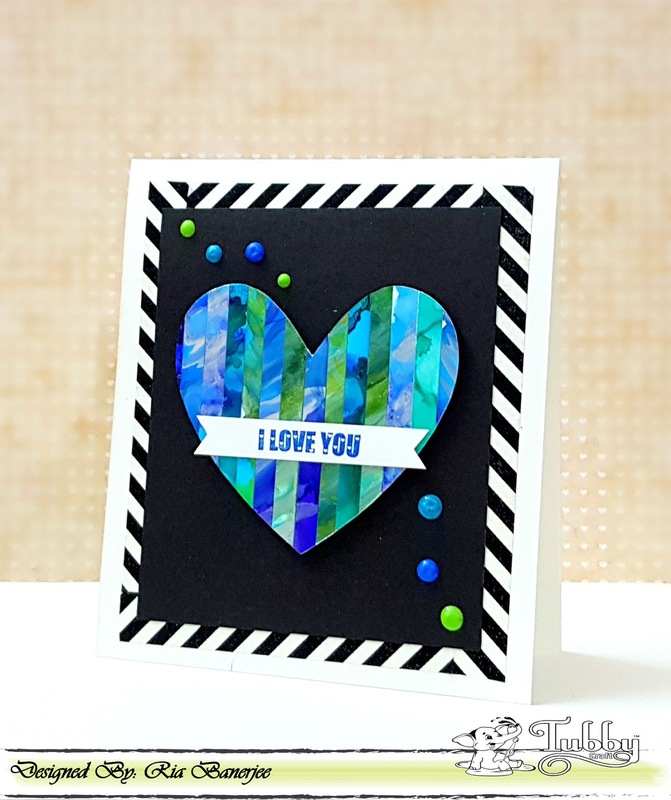 Take an A4 card base and mask off a oval in the center. 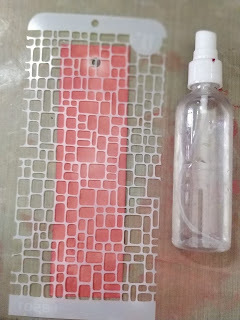 Place the Hero Arts Deco Pattern stencil over it and adhere it temporarily with masking tape. 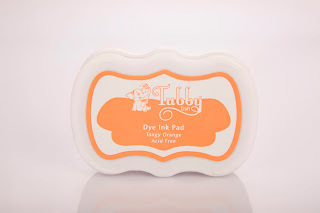 Apply Tubby Craft Lemon Yellow and Tangy Orange inks with a mini ink blender. 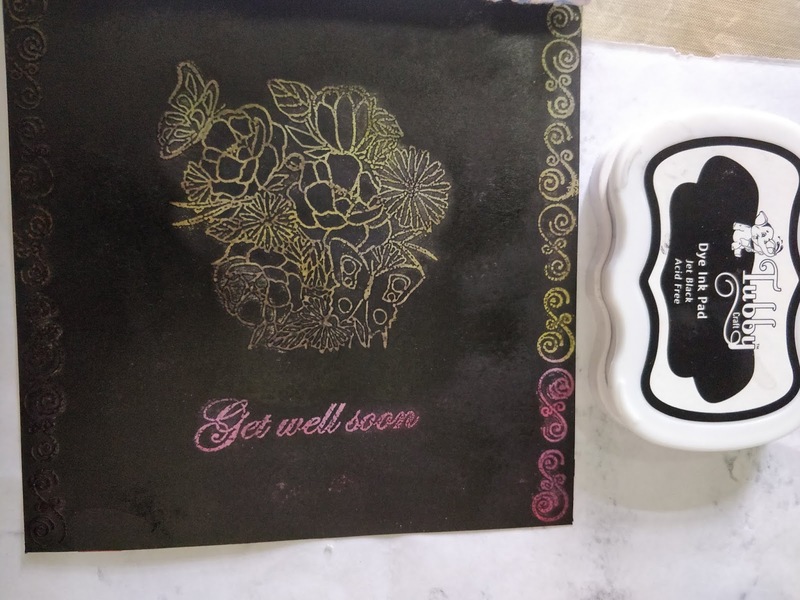 Remove the stencil and the oval mask and stamp the 1 image and the sentiment with Jet Black ink. That's it!! 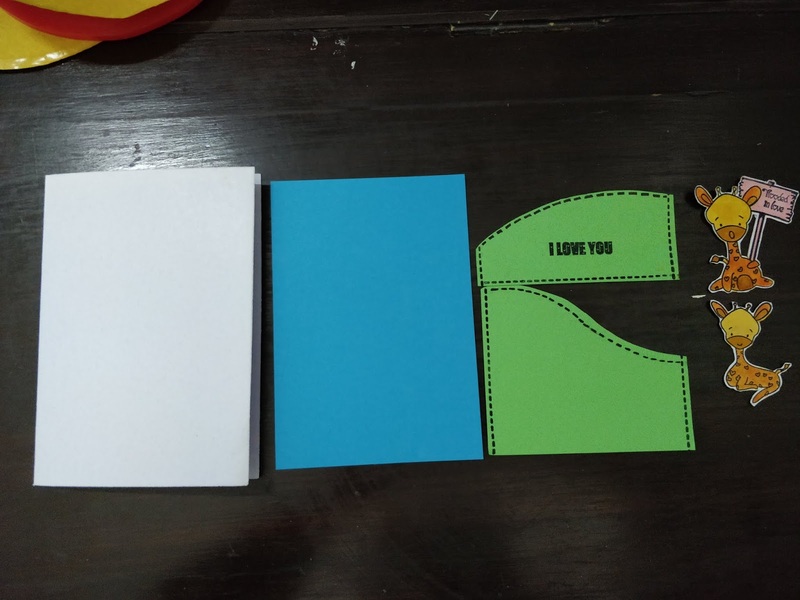 It's pretty simple and quick to make. 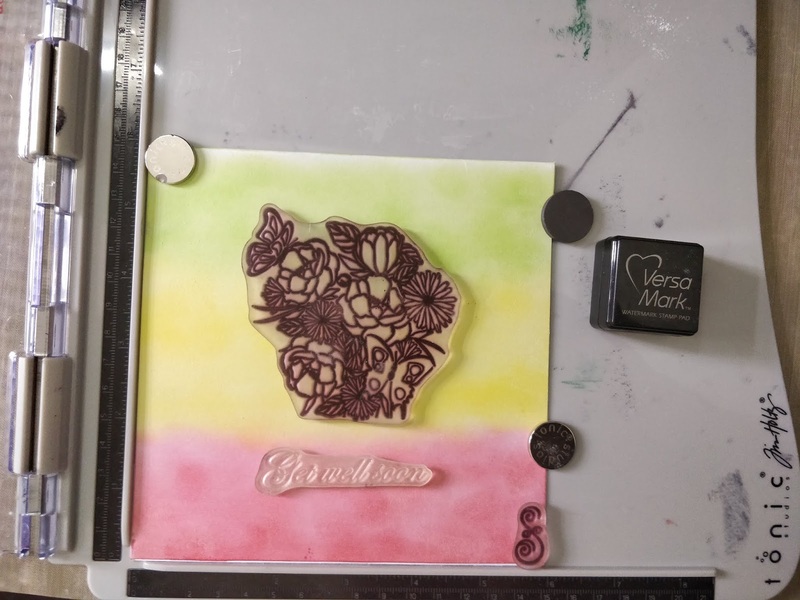 Take an A4 card base and place the Hero Arts Large Flower Stencil over it. 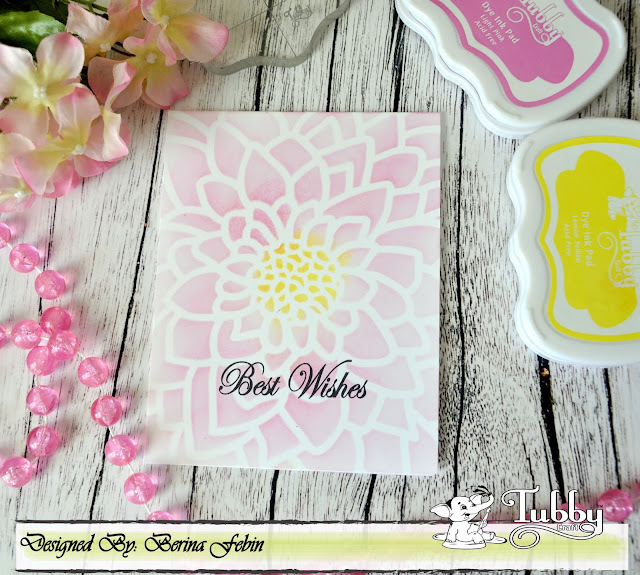 Apply the Tubby Craft Lemon Yellow ink in the center and Light pink ink everywhere else. Remove the stencil and stamp the sentiment with Jet Black ink. That's all for today! I love the soft blended look of these cards!! 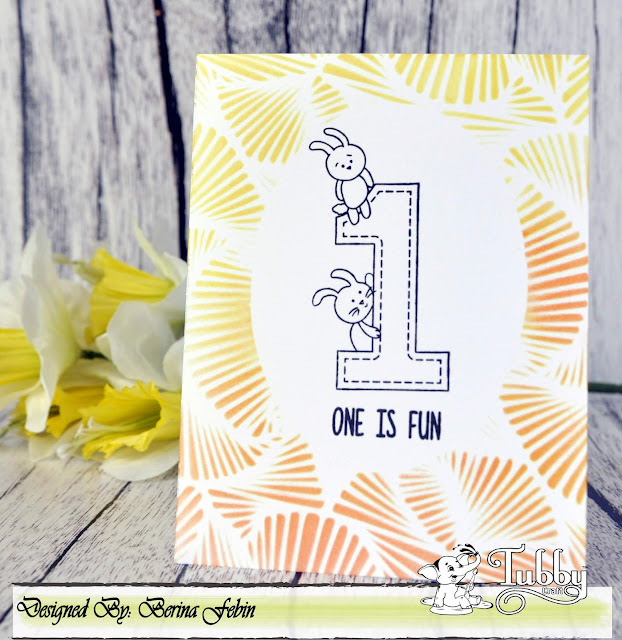 First I have stamped the sentiment from Adorable Runner repeatedly with Yellow dye ink from Tubby craft. Then I stamped the same sentiment with Jet black dye ink. I didnt mask the area as I wanted a see through from the critter image. 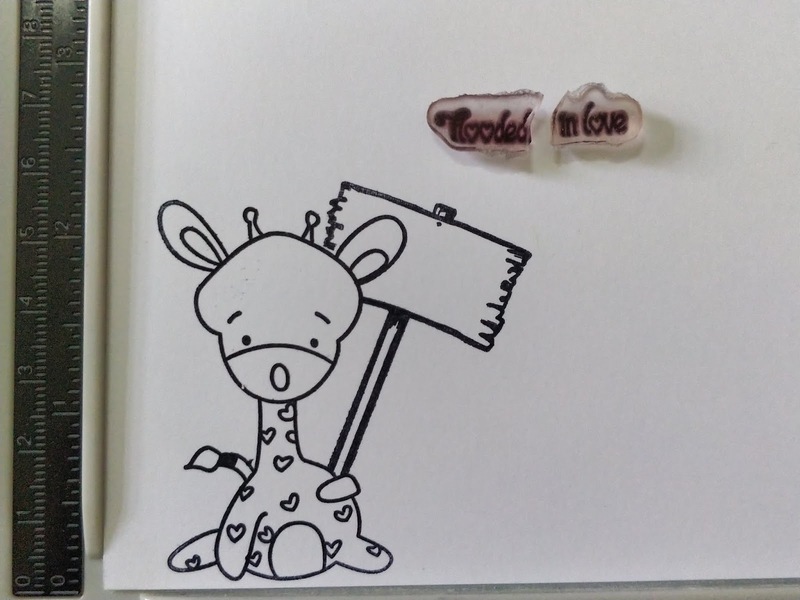 I stamped the image from Giraffe Love and colored it. Finished the card with few enamel accents. I had few scraps of alcohol inks on yupo paper. I cut them into stripes. I took a masking paper and adhered the strips of different designs. 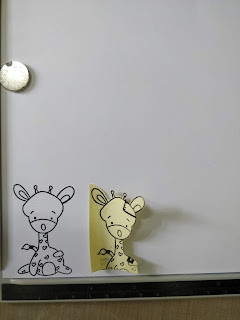 I have used the sentiment from Giraffe love. 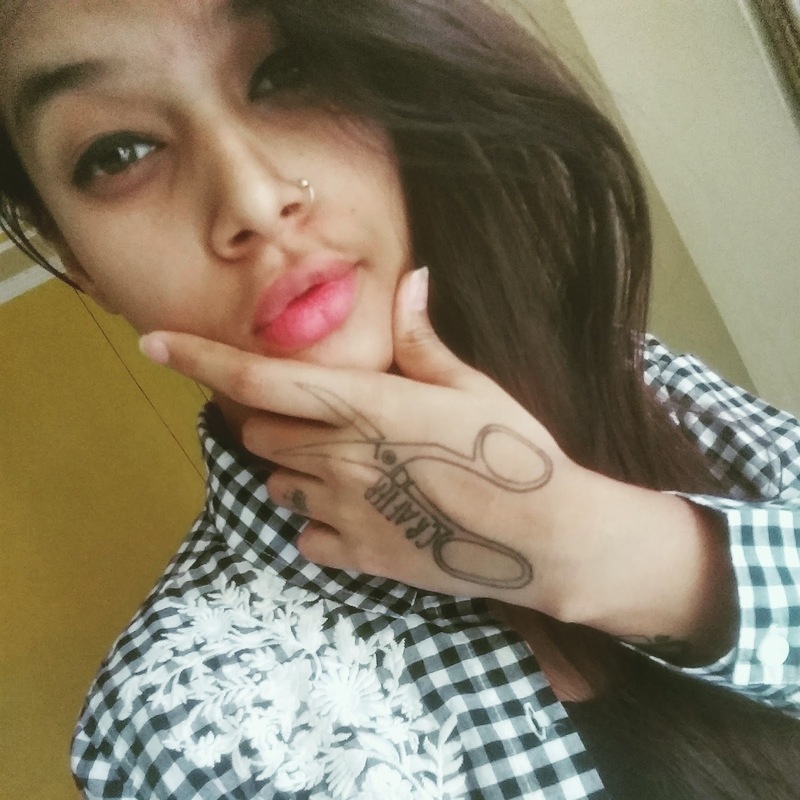 Devika here. 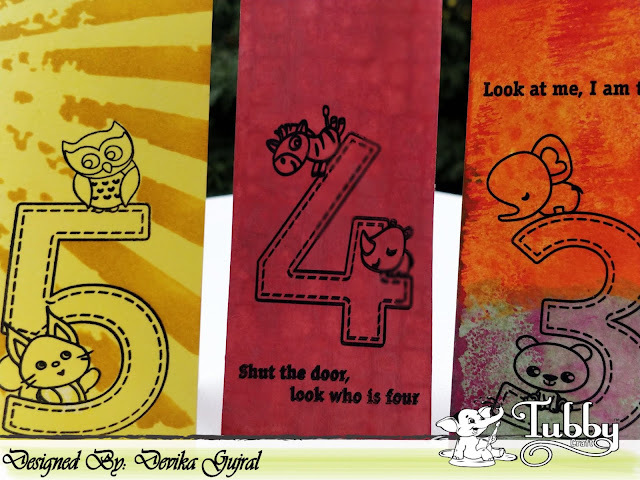 I have 3 birthday tags for the little ones on the blog today. Take a rectangular piece of White cardstock. Smoosh it with yellow ink. Stamp the image from the Jiving Five stamp set on the yellow coloured base. 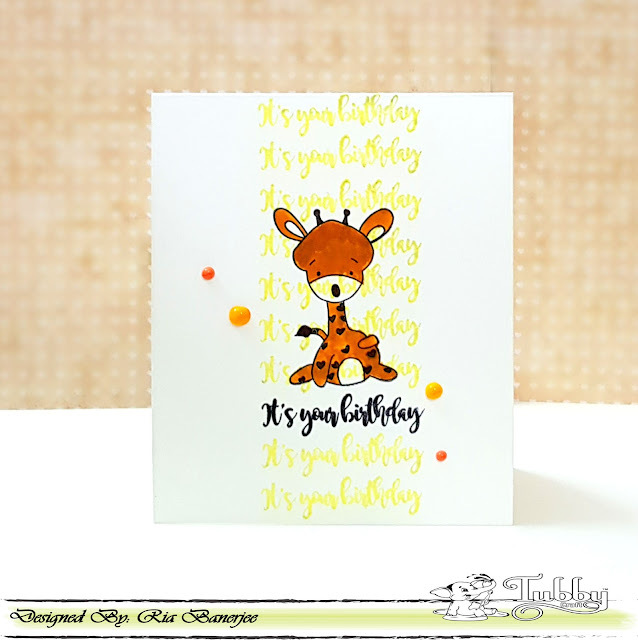 Mask the stamped image with fussy cut stamped image on masking sheet. 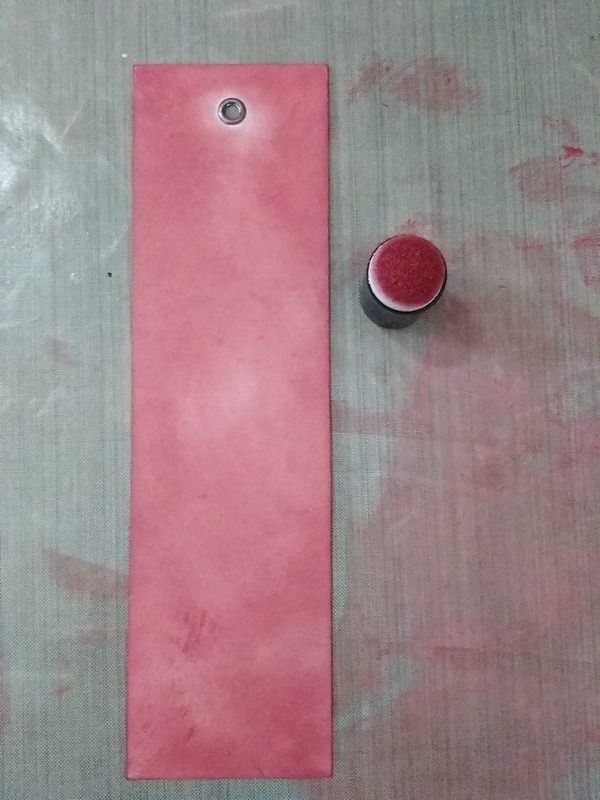 Apply a darker colour shade of ink through the stencil. 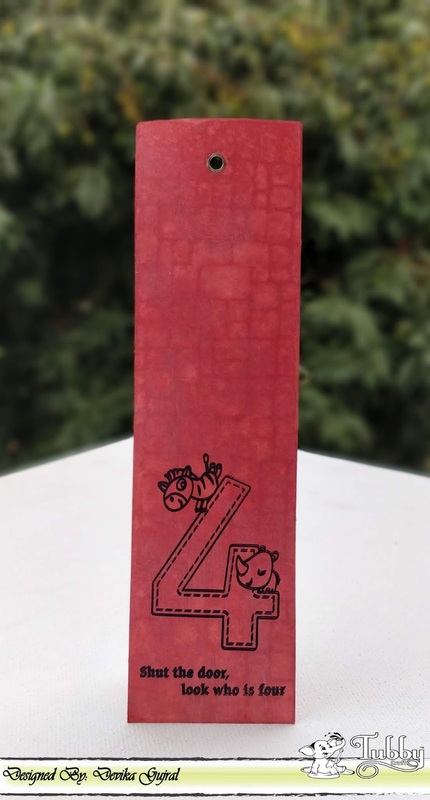 Smoosh it with red ink. Put a stencil over the inked area and sprintz it with water. Dab it with little pressure with a paper towel. 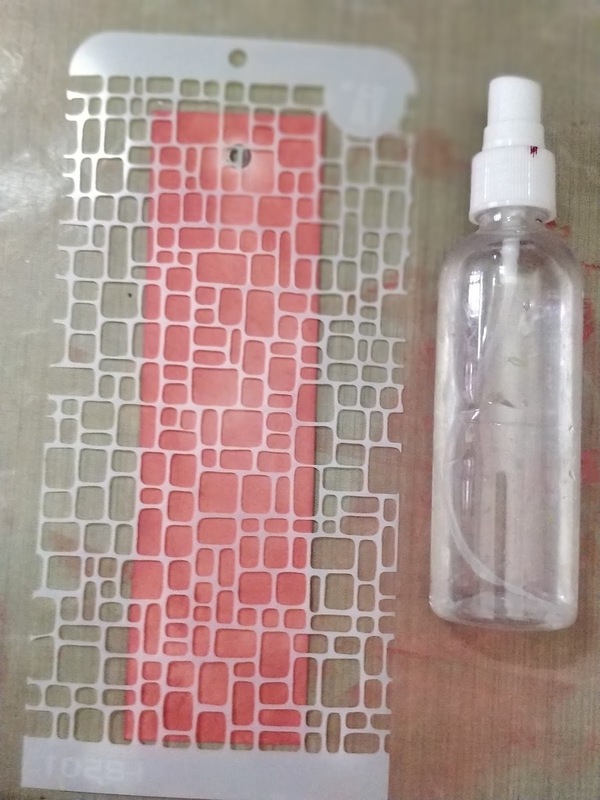 You will get a bleached image of the stencil. 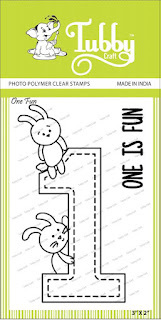 Stamp it with the from the stamp set. Smoosh the top portion with pink ink, middle portion with orange ink and the bottom portion with green ink. Sprintz the area of the craft sheet which has these 3 coloured inks smooshed onto it, with water. 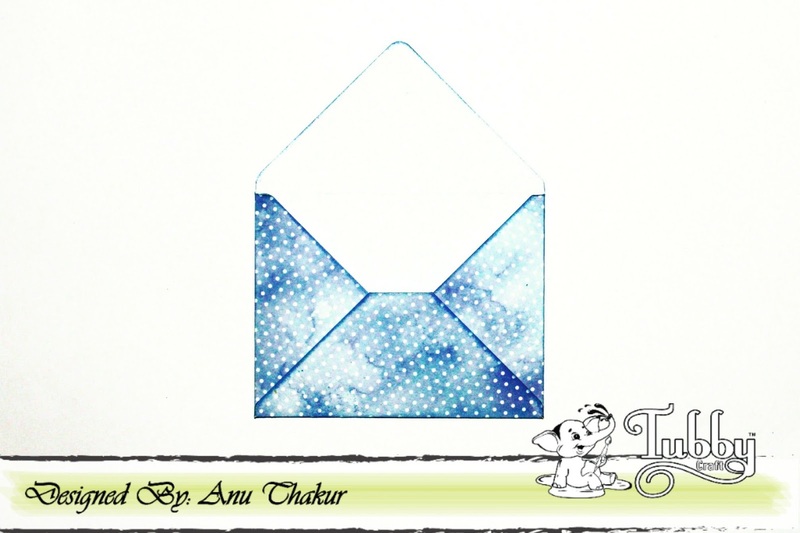 Glide the rectangular piece of coloured cardstock through the inked puddle. Stamp the image from stamp set. 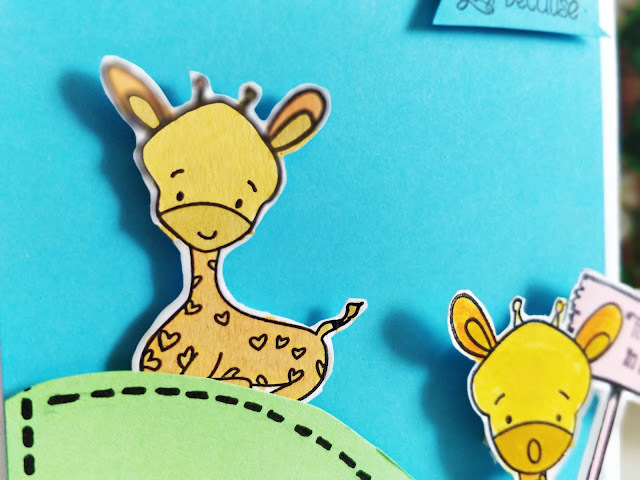 Hello crafty people ! I hope you guys doing well ! 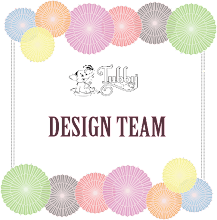 A heartful thanks to TUBBY CRAFT for having me here as a guest designer. Today I am here at TUBBY CRAFT blog to share with you all a super cute envelope + card that i crafted using the tubby craft "ADORABLE RUNNER" stamp set & TUBBY DYE INK PADS. 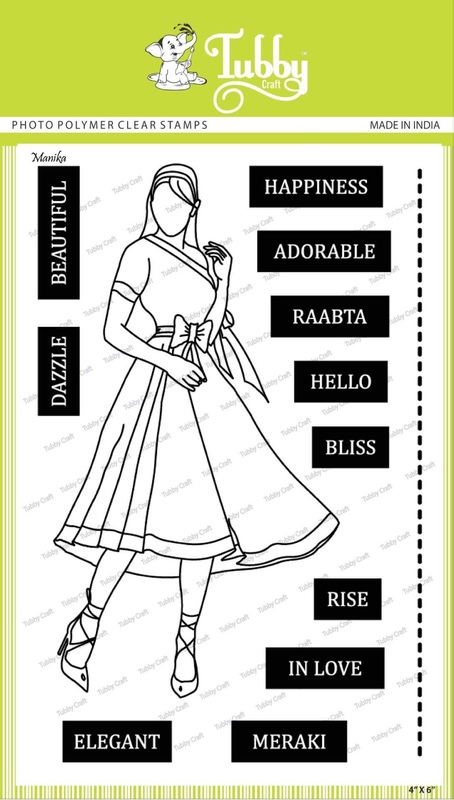 & the best thing is that i have its pictorial for you all ! yayy !! Here I took a 6x6 inches of pattern paper & made an envelope of it using my score board , where the A side is scored at 2 inches & B side at 2.5 inches & then i did some ink blending on the edges with tubby craft sapphire blue dye ink pad. 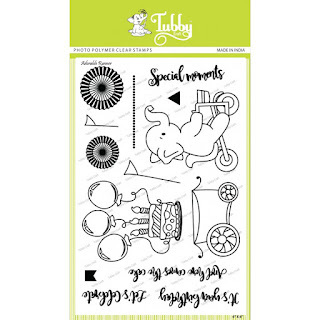 Stamp, color & fussy cut the following images from the tubby craft ADORABLE RUNNER stamp set. Here I combined the two stamped cutouts. 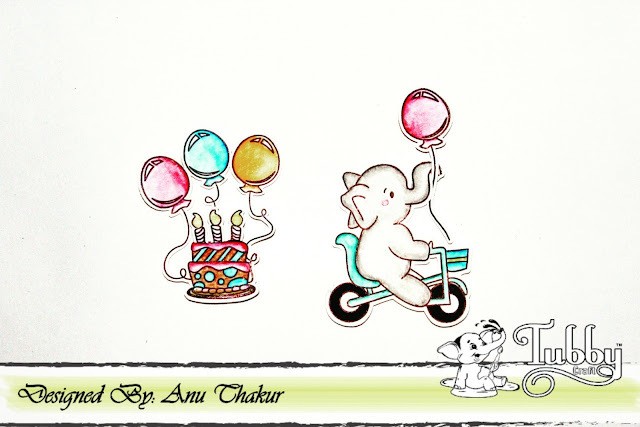 I adhered the balloon to the elephants trunk & the tiny candles on cake using some foam tape to give it some dimension. 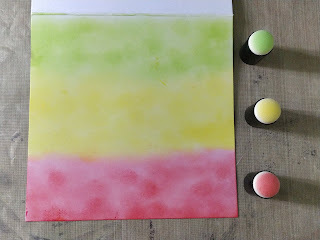 Take another pattern paper to make grass background & adhere it to the bottom of the envelope. 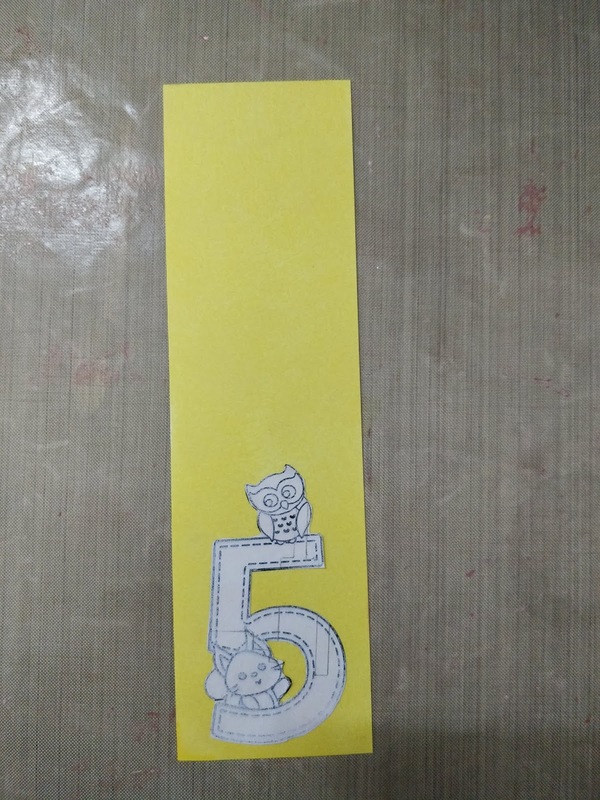 Adhere the following stamped images as shown with foam tape to give dimension. 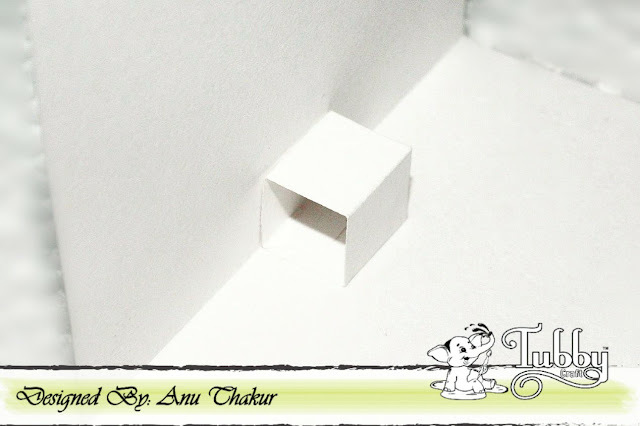 Take a long piece of white cardstock measuring 4.25x6.5 inches & fold it into half. 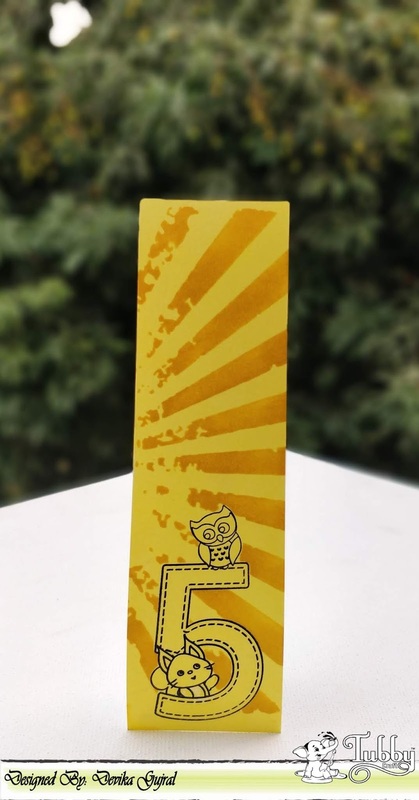 Take another piece of cardstock measuring 2.25x0.75 inches & score on the longer side at 0.5", 1", 1.5", 2" fold along the score line to make a hollow box. Take the box & adhere the same on the inside of the card previously made as shown in the picture. 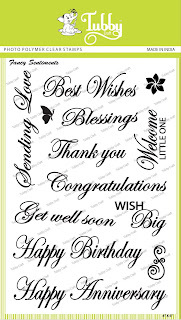 Now adhere the cake image to the popped up box & add the sentiment below as shown. 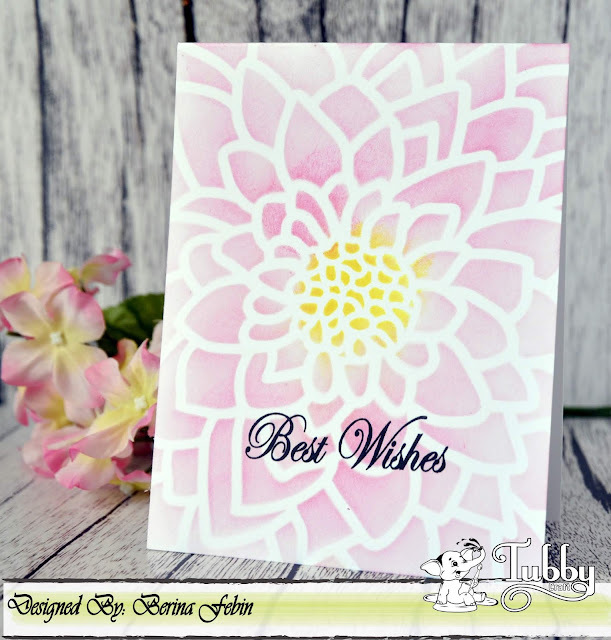 Complete the card by adding a scalloped circle & sentiment on top. 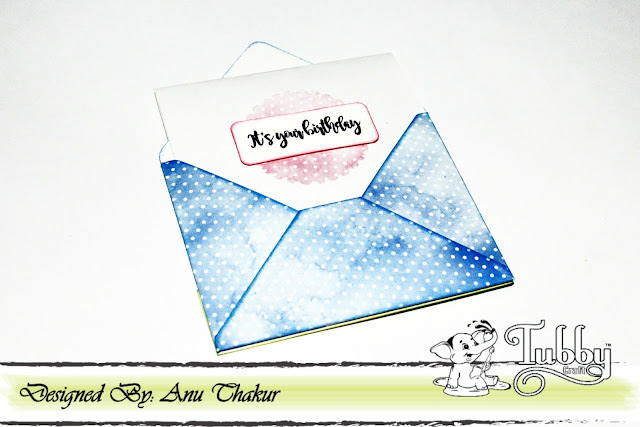 & the card is ready to go inside the envelope. The quality of stamps are superb. Crisp & clear images. 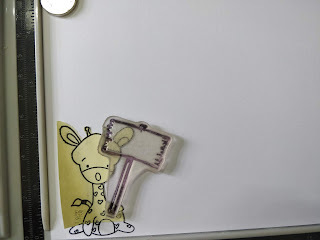 They really stick to the acrylic blocks well each time no matter how many times you stick & pull back & re stick it. I loved the sentiments made in the calligraphy fonts I'm fond of it & the stamp designs are super cute. 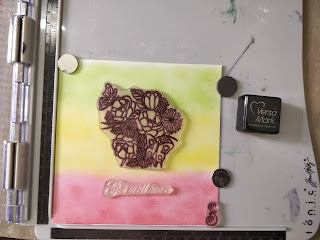 The dye ink pads comes in a lot of shades but for now i tried only 2-3 of them. The ones i tried my hands on i must say are appreciable. 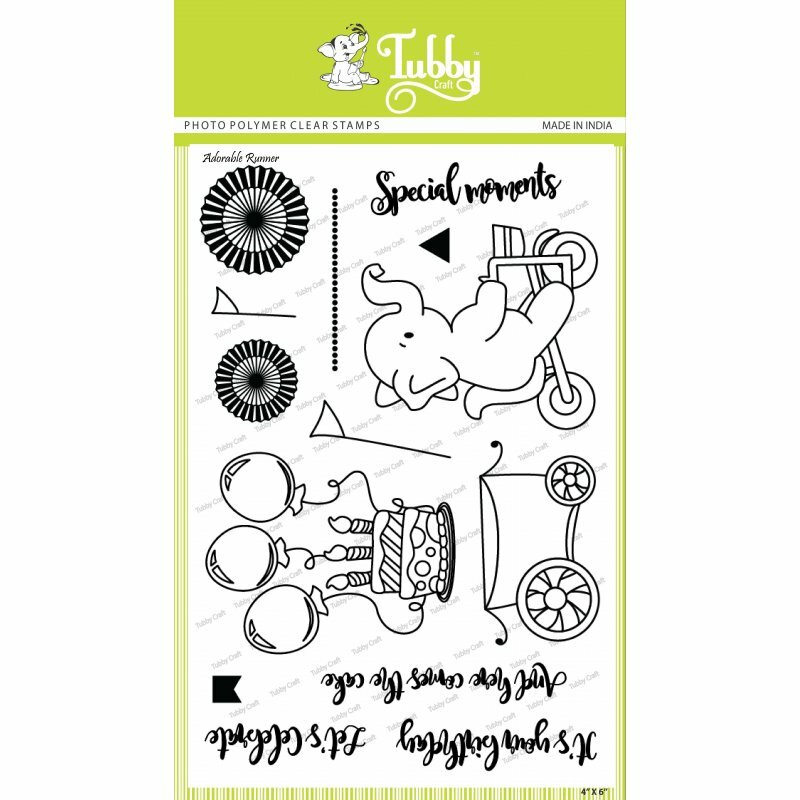 They are economical (just rs.100) , widely available at many online craft stores, & most importantly amazing to work with. 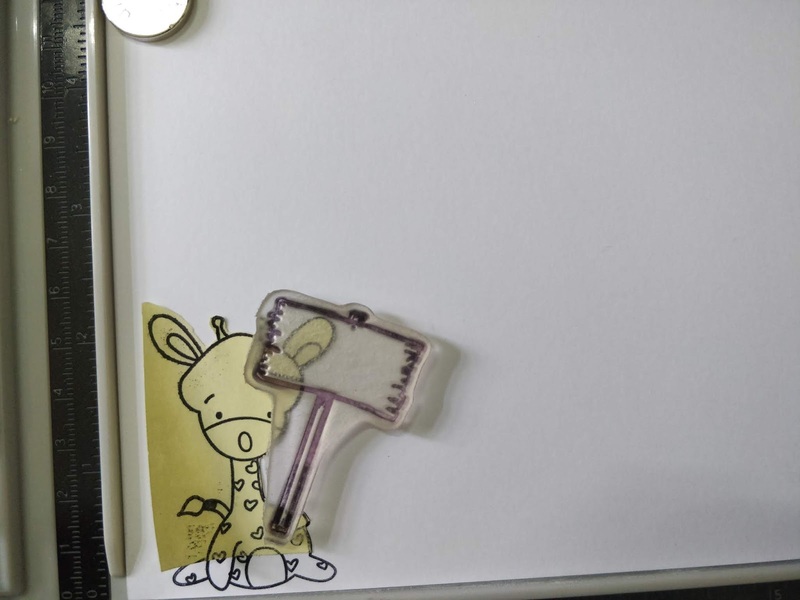 Packaging is made good. 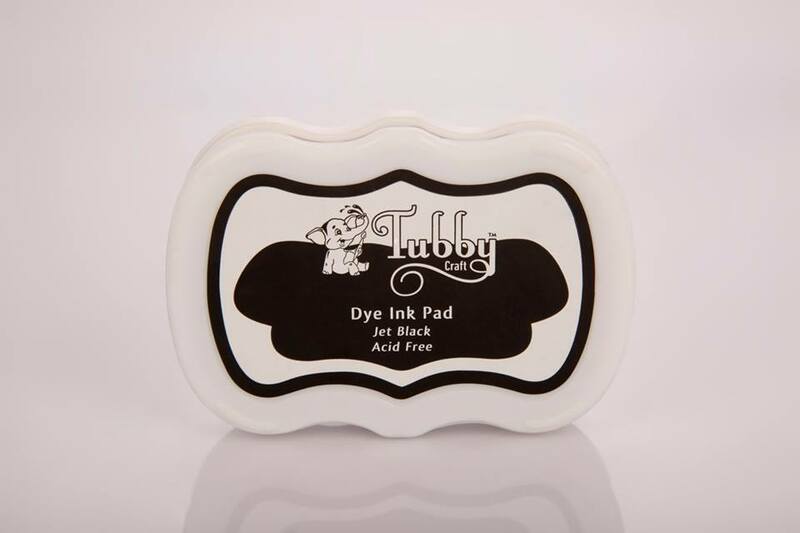 The ink pads are handy, light weight & easy stack-able storage. 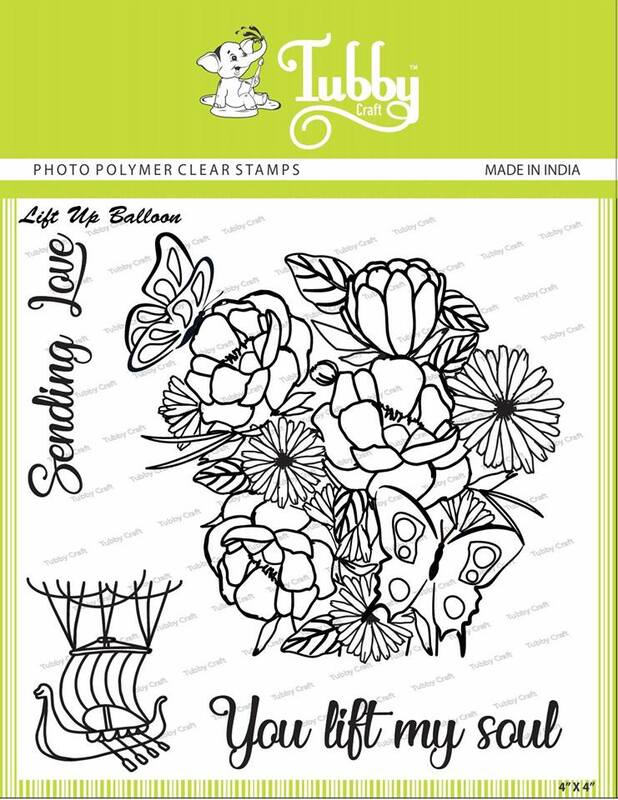 You can use them for stamping, coloring, ink blending, stenciling and what not. P.S. 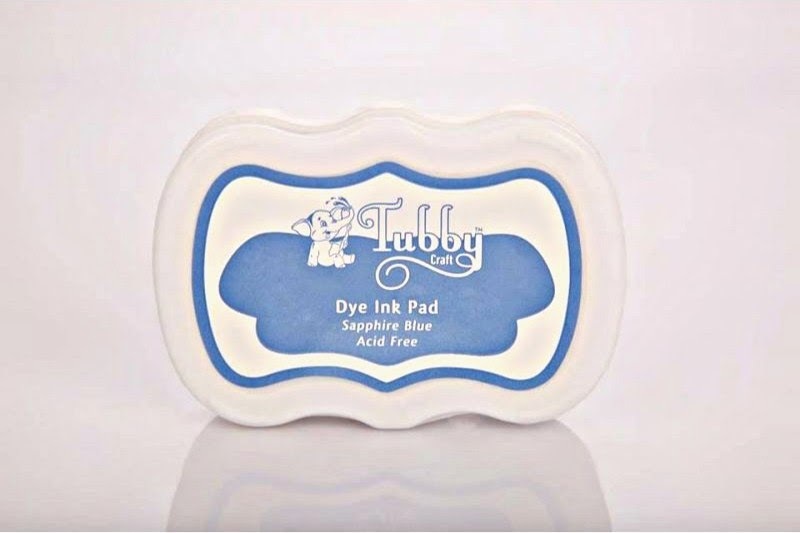 Trust me give it a try you guys will love to work with these stamps & ink pads. So here that was all from me today. I hope you guys liked my card & i hope this review be helpful for you all. Do let me know if you have anything to say in the comment box below. until next time ! happy crafting !